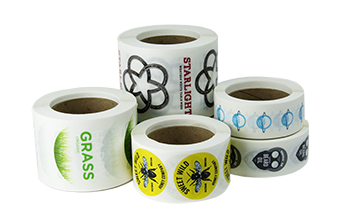 Clear Labels will be best for indoor use, and are an ideal option for labeling products of just about any kind. They are resistant to oils and water, so you can use them on body care products like lotions and beard oils. You can also find this type of label used in a way that intentionally lets the product show through the label. Which is a nice design element to consider if your product has its own appeal aside from your branding and packaging. With all of our labels, you can choose the orientation of your designs when they are finished on a roll. This might only be a concern for you if you plan on applying your labels with a label application machine. Check out our Custom Labels page to see how your labels can be oriented on the roll, if this is something you think you will need to decide. Clear Stickers are water and oil resistant in the same way as our Clear Labels and they are also ready for the outdoors with a UV laminate. With a bit more versatility, you can use Clear Stickers as promotional stickers, product stickers, and even car window stickers. Clear Stickers can also be printed with a front face adhesive, turning them into window stickers you can use on inside surfaces facing out! We talk about that more in our page on how we can print your Clear Stickers with a front or back face adhesive. Compared to Clear Labels that are finished on a roll, our Clear Stickers are finished as Kiss Cut stickers, which means they will be cut onto a paper backing, with a small amount of backing visible around your custom shape. Much like having your Clear Labels on a roll, having a small amount of backing behind your Clear Stickers makes them easy to peel and apply. Clear Stickers are also available as Sticker Sheets as a way to include multiple sticker designs on a single sheet. Because both of these products are printed on a clear polypropylene material, there are some design qualities that will apply to both. Our Clear Stickers and our Clear Labels are printed on a clear material, which means the sticker around your designs will virtually disappear when applied. This is a design element you can use to your advantage, such as using it to make your designs stand out on a variety of backgrounds for multiple looks from a single design. With both Clear Stickers and Labels you have the option of using a layer of white ink behind your designs. When we print a layer of white ink behind your designs, it helps to increase the opacity of your artwork, and the visibility of your designs against darker surfaces. However, you can leave the white ink option out, and give your custom stickers an entirely different look, that is closer to a stained glass window effect. Both Clear Stickers and Labels will always have a glossy finish. This naturally gives them a high quality appeal, and adds a professional finish to your branding or package labeling needs. We also love printing custom shapes, and Clear Stickers and Labels are no exception to this. The clear qualities of these stickers and labels looks great with simple and complex designs, and offer versatility that can be used in many different ways. While our Clear Labels have your indoor labeling needs covered, you can rely on our Clear Stickers to keep your brand alive in outdoor settings.